Drawing the human face is hard. It’s hard, not just because of the intricacies of the facial features, but also our own ability to see if something isn’t quite right. So I decided to embark on an artistic journey, creating 99 portraits to help me understand the face better and to develop my own styles further. I hope you decide to come along for the journey! Below are the first six portraits, drawn between May 27th and June 6th, 2016. Drawn at the May 27th life drawing session at Jankura Artspace, I produced this profile relatively quickly in about 20 minutes. The great thing about life drawing sessions is that it helps me focus on the task at hand. After I decided to take on the project, I put out a request via Facebook for volunteers to let me draw them. To sweeten the offer and to kick start the project properly, I offered the final drawings for free (save for shipping cost of outside Korea). The first person to request a portrait was a friend from college who asked if I could draw her two kids. And so I did. Working at home on these two took much longer than at the studio. On the one hand the environment was not as focused and I also could take as much time as I needed. Throw in distractions of a computer and household chores and it takes longer. The question is, does the extra time add anything? Portraits four and five were done at the June 3rd life drawing session. While this is a good way to work on the overall number of portraits I’ve finished, I think in the future I might refrain from jumping strait to the portraits and work on the total figure. The second upside to doing portraits at life drawing sessions is I feel less guilty about giving them fun titles. Last night I finished portrait six. I had some problems with this one. My initial drawing was way too narrow so I had to start over. I decided to add some studies of eyes on the side because sure, why not? I also did this rough sketch of a singer. But I feel it’s too rough to add to the canon of 99. I currently have about six more requests lined up. If you would like me to draw you, please comment below and I’ll add you to the queue! I look forward to seeing more of your portraits. 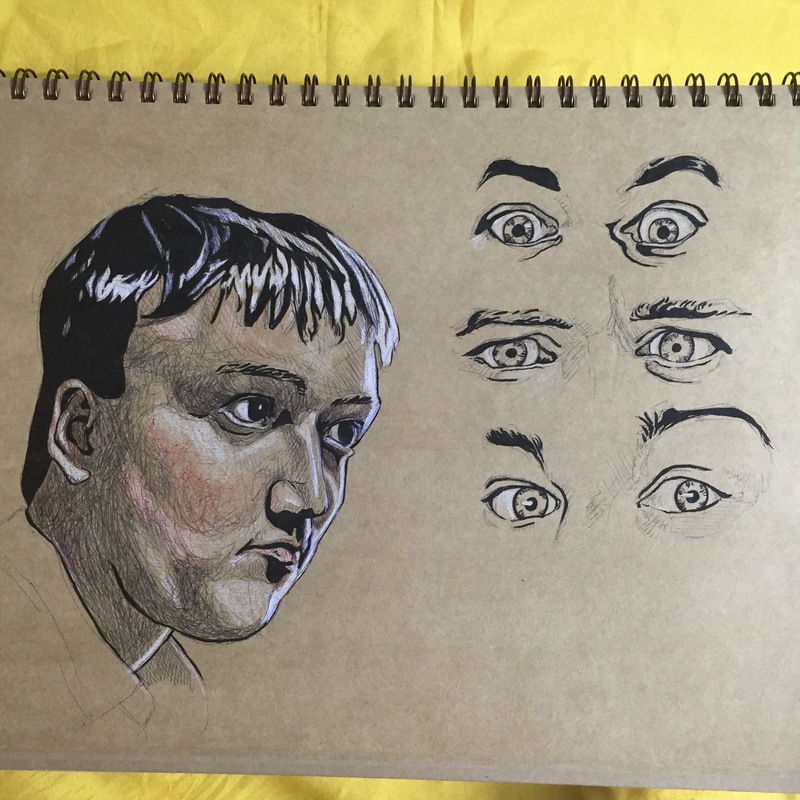 I’m working now on facial features and how to create different expressions. You’re right, the human face is a challenge to draw. I hope with practice I’ll be able to improve my drawings. Yours are certainly an inspiration. I’m glad I can be of some inspiration. ^-^ I hope your own artist’s journey sends you places you never expected! It has, indeed! I’m amazed at how much I’ve learned in my first year of drawing, and I can’t begin to imagine where I might be in another year. I’m loving my journey and discovering new things every day.